Leveling up is a key aspect in the game, as it gradually increases a Dragon's Attack and Health stats, as well as its Gold production. A Dragon must be fed four times per level in order to increase in level by one. To feed a Dragon, the button must be pressed inside the screen used for inspecting the Dragon. When a Dragon reaches Level 4, it changes from baby form to adult form, allowing it to be eligible for breeding, to engage in any kind of battle and defend forts, to be trained and to improve its skills and learn new masteries. When a Dragon reaches Level 16, it can be enchanted. Except Boss Dragons and Clan Dragons, all Dragons in the Trainer's possession can be leveled up. On some occasions, whenever the Trainer has no Food left to feed the Dragon, the option of watching a video in exchange for (200*Level Modifier) Food might be offered, provided the amount necessary to feed the Dragon does not exceed the one offered by the video. If that offer is not given or if the Trainer dismisses it, another screen will appear, giving the Trainer the option to close it, or to choose between the and options. Selecting the Farm button will take the Trainer to the closest unoccupied Farm whereas selecting the other button will take the Trainer to the menu for purchasing Food. Below is a table of the amount of Food needed to reach the next level, the individual feeding amounts, and the total needed at that level. Starting with Level 80, the amount of Food needed to level up stays the same for each level. The maximum level is 100 and the total amount of Food needed to reach it is 335,737,028 . Opposing NPC Dragons are not restricted by a maximum level, thus Dragons over Level 100 can be encountered. Update 4.0 raised the maximum level to 100. Update 2.7 introduced the option of watching videos in exchange for receiving Food whenever the Trainer feeds a Dragon and runs out of it. Update 2.3 raised the maximum level to 80. Update 1.5 raised the maximum level to 70. 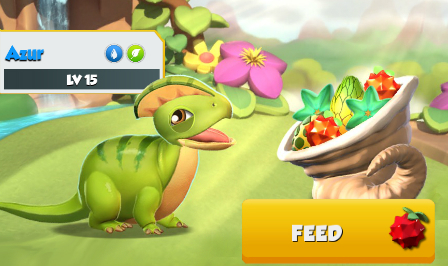 Update 1.1 raised the maximum level from 50 to 60 and the amount of Food required to level up Dragons was changed to a more natural increase.